Suitable for use on Class A (trash, wood & paper), Class B (liquids & gases) and Class C fires (energized electrical equipment). The PRO 210 is fitted with a pressure gauge that provides at-a-glance status, is manufactured from lightweight aluminum cylinder with a tough aluminum valve assembly. 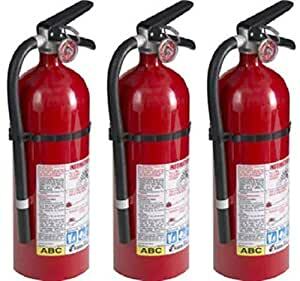 Pro/Commercial 210 Fire Extinguisher, UL Rated, 2-A:10-B:C, Suitable For Common Industrial Use Office, Schools, Hotels, Metal Handles, Levers & Valve, Fully Rechargeable, High Quality Gauge For Easy Pressure Check, 6 Year Limited Warranty, Low Hazards.